Introduced Locations: Bahamas, China, and Puerto Rico. 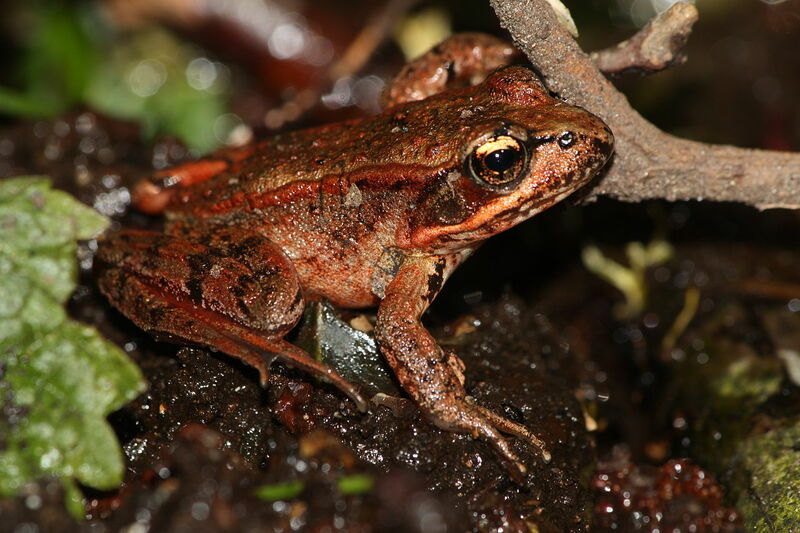 The Pig Frog is named after the male’s mating call that sounds like a pig grunt. Like most frogs in North America, the Pig Frog breeds from early spring to late summer. Generally, the frog breeds in permanent bodies of water such as ponds, lakes, and swamps but have been known to breed in ephemeral ponds, streams, and roadside ditches. Females can lay up to 15,000 eggs during a breeding season. The Pig Frog is mostly aquatic, only coming to the edge of bodies of water. The Marbled Balloon Frog spends most of its life underground, only coming to the surface during the summer monsoons from May to July. They have powerful hind legs, that help them burrow deep in the ground. One frog had been found over 3 feet deep. The frog lacks any teeth, due to their diet of mainly termites and ants. The Cope’s Gray Tree Frog is almost identical to the Eastern Gray Tree Frog (Hyla versicolor) besides their calls and chromosome count. The Cope’s Gray Tree Frog is diploid while the Eastern Gray Tree Frog is tetraploid. The frog is named after Edward Drinker Cope, the man who first described the frog to western science. Edward Drinker Cope described a lot of different species, over a thousand living and dead species. While the frog is named the Gray Tree Frog, it can also be green in color. The Crawfish Frog is named after the fact that they live in the holes of crawfish. They use the holes for protection from predators. In the northern part of their range, they use them to get below the frost line to prevent them from freezing to death. Breeding occurs from January to May following rain fall. 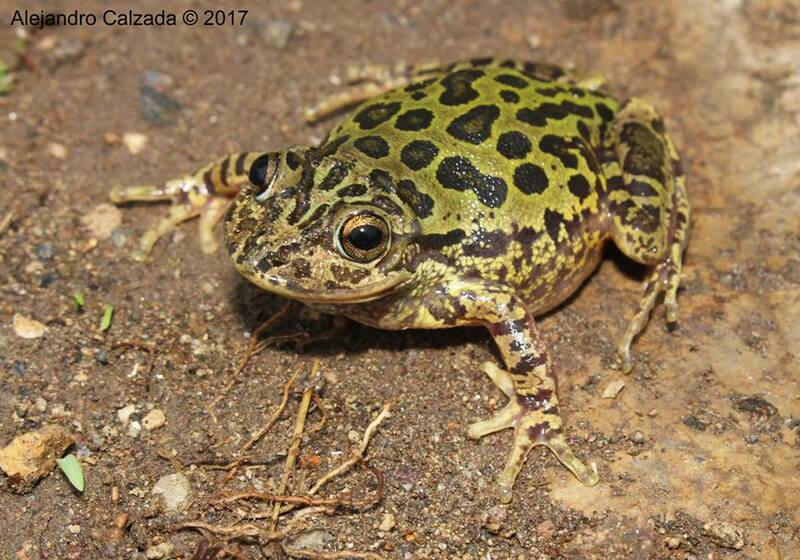 In the northern parts of their range, they breed later from late February to May while frogs in the southern parts of their range breed from January to April. After the rains fall and temporary ponds of water are formed by the rain, the male Crawfish Frogs migrate to these ponds and start calling. Female frogs follow shortly after. Crawfish Frogs are explosive breeders with most of the mating happening right away at the start of the season. One noticeable characteristic of the male Crawfish Frog is their lateral vocal sacs which is not often seen in frogs in the US. There are two sub species of the Crawfish Frog, the Northern (Lithobates a. circulosa) and Southern (Lithobates a. areolata). The Granular Poison Frog is a diurnal (active during the day) species of frog. The males of the species are highly territorial in regards to their calling and breeding sites, even attacking other males. After breeding, the males will brood the eggs and keep them moist. After the eggs hatch, the females transport the tadpoles on their back to a water-filled plant. The females will lay unfertilized eggs for the tadpoles to feed on. The Granular Poison Frog is listed as Vulnerable by the IUCN due to habitat destruction and habitat fragmentation. Logging, agriculture, and expanding urbanization are causing this. Introduced Locations: Anguilla, Costa Rica, Guadeloupe, Puerto Rico, Turks and Caicos Islands, United States (Florida, Hawaii, Louisiana, Georgia, Alabama, Mississippi, and Texas), British Virgin Islands, and US Virgin Islands. The Cuban Tree Frog is a large tree frog native to the Caribbean but has been introduced to other areas of the world such as Florida. In Florida, the Cuban Tree Frog has become a problem. Their size allows them to eat other smaller frogs and other native animals. They also can breed year round and it takes only a couple weeks for the tadpoles to reach frog stage. They also can produce skin secretions that can irritate humans.